Hollywood star George Clooney was taken to hospital after suffering minor injuries in a collision involving his motorbike and a car. The accident happened in Sardinia where the US actor is filming his latest TV series, Catch-22. A representative for the actor, 57, said he was treated and released from a hospital in the Sardinian city of Olbia. "He is recovering at his home and will be fine," the spokesperson continued. "At 8.15am George Clooney was riding his scooter on the State Road 125 towards Olbia from Puntaldia," said a spokesman for the Italian Carabinieri in a statement. "A car (a Mercedes E SW) did not respect the right of way and hit him. George Clooney fell and slammed the windshield of the Mercedes. "The car driver called the 112, the emergency number of Carabinieri, and they sent the Municipal Police, an ambulance and the Fire Dept. "[The] MRI was negative, and he is not seriously injured. George Clooney has already been discharged and he stays well." 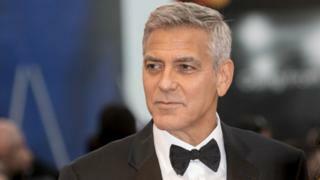 A town hall official in Sassari, Sardinia's second-largest city, also confirmed to the BBC earlier that Clooney had been involved in a "minor accident" but had no serious injuries. The actor plays US Air Force commander Scheisskopf in the World War Two Channel 4 drama, based on Joseph Heller's classic novel. The six-part drama is set to air in 2019. Clooney has had a home on the Italian mainland, on Lake Como, for many years. He has long had an affinity with Italy, is a frequent visitor to the Venice film festival and wed his wife Amal in the city in 2014. Amal, a human rights lawyer, gave birth to twins, Ella and Alexander, in 2017. Clooney is an Oscar-winning actor, known for roles in films such as Ocean's 11, Up in the Air, Michael Clayton and O Brother, Where Art Thou? Clooney and his family are thought to be have based themselves in a villa in San Teodoro in Sardinia while Clooney has been filming Catch-22. However, the star was staying in a hotel for the night in nearby Costa Corallina to be closer to the set, when the accident happened.